MSA comes to you with a century worth of experience. MSA harness run the gamut of comfort, reliability and hi-tech without sacrificing safety. Features like Visco-Elastic shoulder padding for comfort; Nano-Sphere or a coating which repels dirt keeping your harness clean thus increasing the time you have to take between cleaning; and Kevlar/Nomex blend webbing for superior chemical and heat resistance all contribute to making MSA harness an excellent choice in fall protection equipment. 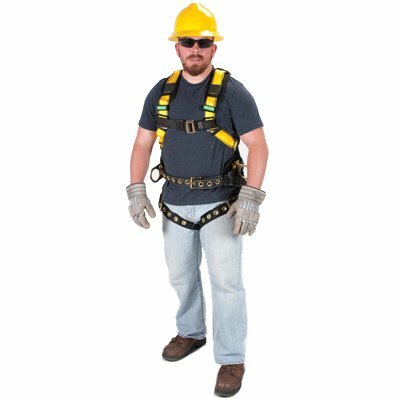 Your MSA harness is part of a fall arrest system and is the component that's worn by your worker. It should be remembered that in the event of a fall, fall arrest forces can potentially cause your worker serious injury especially if these forces are concentrated on a single point. MSA harnesses were designed to evenly distribute fall arrest forces throughout the body particularly the chest, thighs, waist, pelvis, and shoulders, greatly reducing or even completely eliminating the risk of injury in the event of a fall. This is achieved through a series of straps. Harnesses come in different sizes though there are a number that are universal. Whichever harness you use, it's important to properly fit the equipment to your body.